Developed for use as a single-phase impression material, AFFINITY Monophase maintains the most desirable properties of polyether such as a gum-like consistency, high durometer cure, and high tear strength. However, unlike polyether, Monophase is far more cost-effective, sterilizable, and dimensionally stable. It is ideal for implant impressions, edentulous, and partial impressions, as well as for the fabrication of clear aligners in orthodontic treatment. Available in regular set only. Uncompromised Physical Properties. Unmatched Clinical Performance. Unparalleled Accuracy. AFFINITY™ Hydroactive Impression Material is your surest step toward consistently accurate impressions. Among its many virtues are independent working and set times that in the end reduce the overall procedure time, excellent physical properties that aid in both the accuracy and predictability of the material’s performance, and a variety of viscosities for your preferred impressioning technique. All this, because of a unique 3rd generation chemistry. What is 3rd Generation Chemistry? Enhanced hydrophilicity for excellent performance in the presence of moisture, especially with subgingival preparations. Matched fluid states between the tray and wash materials to better capture the preparation site. 100% cure, which translates to high tear strength and dimensional stability. Previous generation materials have a surfactant, of course, but it is ungrafted, preventing a complete cure and compromising physical properties. No matter how much working time you use, 3rd generation AFFINITY’s set time is always less than 3:00 minutes. Why? The working time is independent from the set time. That means you can use as much of the 1:45 minute working time as you need, place the material intraorally, then set your timer for 3:00 minutes. No need to add the unused working time to the set time like you have to do with previous generation materials! In addition to lessening patient discomfort and the possibility of gagging, a faster intraoral set time helps prevent distortion, as there is far less opportunity for tray/material disruption, which can occur when a patient swallows, or is in discomfort. For single preparation impressions, try our fast set formula in four viscosities. You’ll get 1:10 minutes of working time and a less than 2:00 minute set time. And the same principle holds true – use only what you need of the working time; the set time never changes. 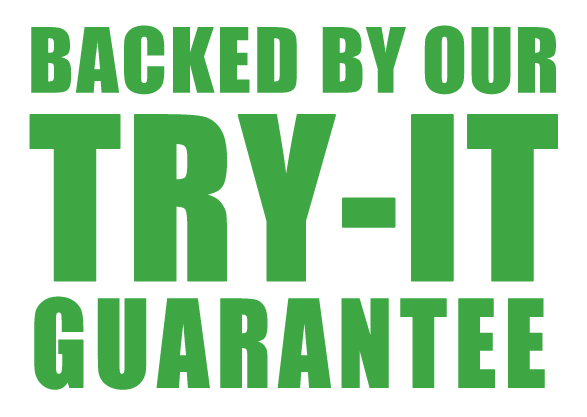 AFFINITY’s 3rd generation chemistry gives you 100% cure due to its unique grafted surfactant. As a result, AFFINITY’s tear strength is clinically superior to that of competing materials. 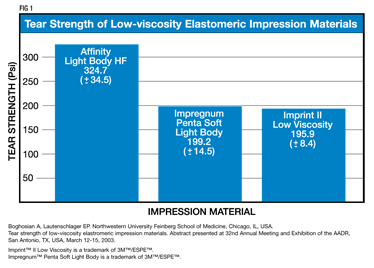 In a clinical study, AFFINITY Light Body HF exhibited tear strengths in excess of 50% higher than Imprint™ II Low Viscosity (3M™/ESPE™), and Impregum™ Penta Soft Light Body (3M™/ESPE™) (fig 1). CLINICIAN’S CHOICE®, in collaboration with leading clinicians and general dentists alike, developed viscosities specifically designed for your preferred impression-taking technique. Try Light Body HF (High Flow) if you like your material to flow on its own. If you’d rather air syringe the material into the sulcus, reach for Light Body RF (Regular Flow). If you use any dual-arch tray, InFlex Tray Material is designed specifically for the closed-bite technique. Whatever procedure you’re about to undertake on your next patient – a bite registration, an edentulous impression, any impression with a stock or custom, metal or plastic tray – there is an ideally designed AFFINITY viscosity that will consistently produce the accuracy you demand. Experience the benefits of Advanced 3rd Generation AFFINITY InFlex Maximum Support Tray Material and AFFINITY Heavy Body in automated mixing machine format with NEW Megamix cartridges. Click the button below to add the Affinity Monophase* to your wish list.